[D]1820 x [L]1500mm – comes complete with electric heater, rocks, full length Cedar benches on both sides, glass sauna door in Cedar frame with door handle, light fitting, bucket, ladle & thermometer. 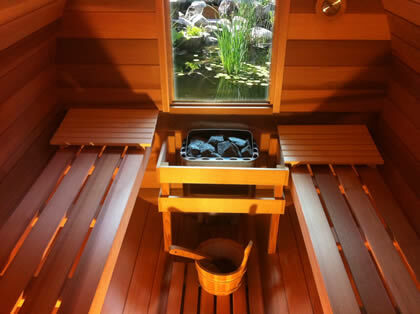 [D]1820 x [L]1800mm – comes complete with electric heater, rocks, full length Cedar benches on both sides, glass sauna door in Cedar frame with door handle, light fitting, bucket, ladle & thermometer. [D]1820 x [L]2100mm – comes complete with electric heater, rocks, full length Cedar benches on both sides, glass sauna door in Cedar frame with door handle, light fitting, bucket, ladle & thermometer. [D]1820 x [L]2400mm – comes complete with electric heater, rocks, full length Cedar benches on both sides, glass sauna door in Cedar frame with door handle, light fitting, bucket, ladle & thermometer. [D]1820 x [L]2700mm – comes complete with electric heater, rocks, full length Cedar benches on both sides, glass sauna door in Cedar frame with door handle, light fitting, bucket, ladle & thermometer. 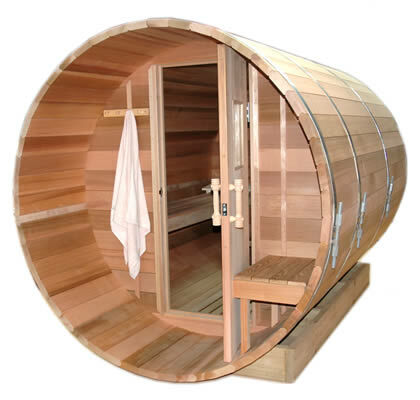 Note: All saunas supplied with stainless steel bands and sauna base made out of thermotreated pine. Not sure about this product? Have a question?